I was so excited to use my new American Tourister Disney Luggage. Disney has so many options to choose from that everyone, young and old, will be looking forward to packing for their next adventure! My trip was amazing last month as I traveled to the Zootopia Press Event in Orlando. In case you haven’t figured it out yet, I am a bit Disney obsessed and like to show off my fandom in all ways possible. I grew up with Disney movies and am so luckily that the Disney universe is ever-expanding now that I am a parent. From Star Wars to Marvel to the classic films, there is such a rich world to share with my children. So, if you come into our home, you won’t have to look far to find something from Disney. Now, we have the ability to show off our Disney love when we leave the house! If you were following along on my Orlando adventures you saw that I was sporting my new American Tourister Disney Luggage! Both my children have always loved Mickey Mouse Clubhouse. I remember my son saying those magic words when he was so tiny! Now, my youngest daughter absolutely adores Minnie Mouse. 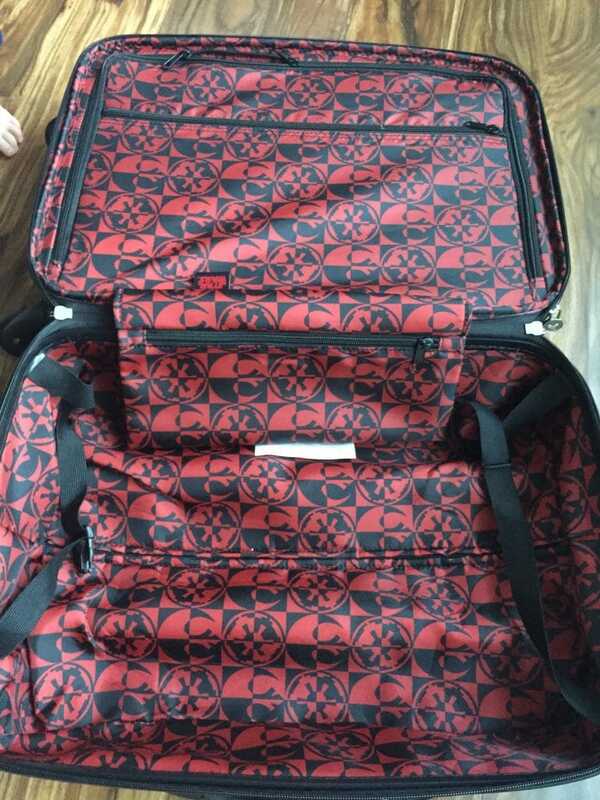 American Tourister has super cute Minnie Mouse luggage. She is our Disney icon and as soon as we laid our eyes on this beautiful piece of luggage we knew we had to have it. She comes in 2 different sizes, 21″ and 28″. We have the larger size and I can tell you that it can fit both of our clothing for an entire week in it. It is huge! The hard shell protects what we have inside so there is no fear of things getting broken. The wheels glide so easily in the airport, making it very easy to maneuver. If you prefer a softer suitcase check out the Classic Minnie. I had a hard time choosing between these two Minnie Mouse st yles. I have decided that I am going to purchase this one as well. There will come a day when my daughter and I will need separate suitcases so this will be my backup for when that time comes! Actually, she will probably take this to college with her too! While Minnie Mouse took care of the girls in the family, we still had to get some Disney Luggage for the boys. 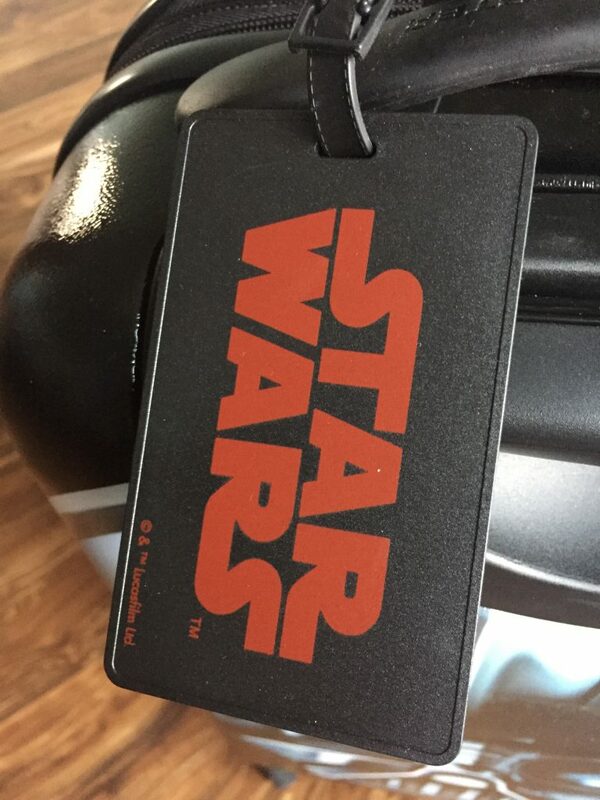 It didn’t take much discussion for them to decide to go with a Disney Star Wars suitcase! My didn’t have to travel to a “Galaxy Far, Far, Away” in order to find my son’s selection. When he saw Darth Vader, it was all over! For some reason, he seems to be gravitating to the Dark Side. Yikes! My husband has always had a soft spot for R2-D2. So, he choose that character. The r2-D2 luggage looks so cool! The bag is basically in the shape of the the robot, so it looks like my husband is towing him around the airport! Both them constantly get complimented on there luggage. Everybody loves Star Wars! Here is a look at the inside of the Darth Vader luggage. I love how the inside matches the outside. So many times your luggage looks great on the outside and then you open it up and it is so boring inside. This carry on easily held a weeks worth of clothes for my 7 year old son. The zippered pocket divides the suitcase in half and is perfect for when my kids spend the night at their grandparents house, they each get a side. 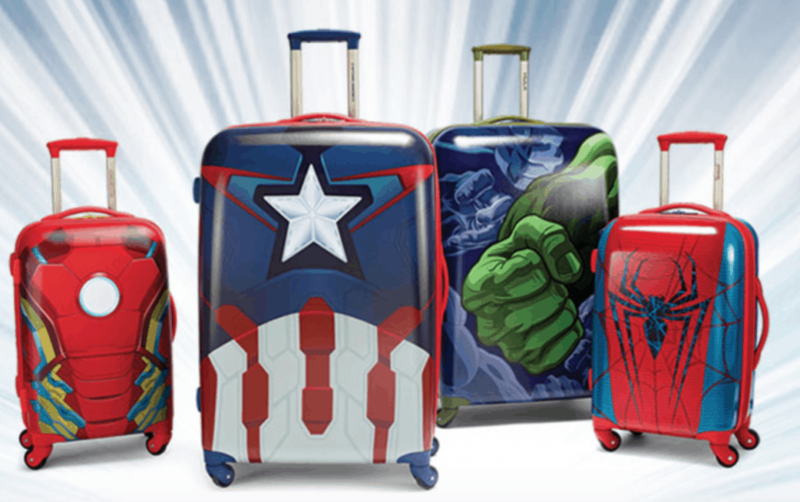 One of the things I like so much about American Tourister is that they have both kids and adult Disney luggage. 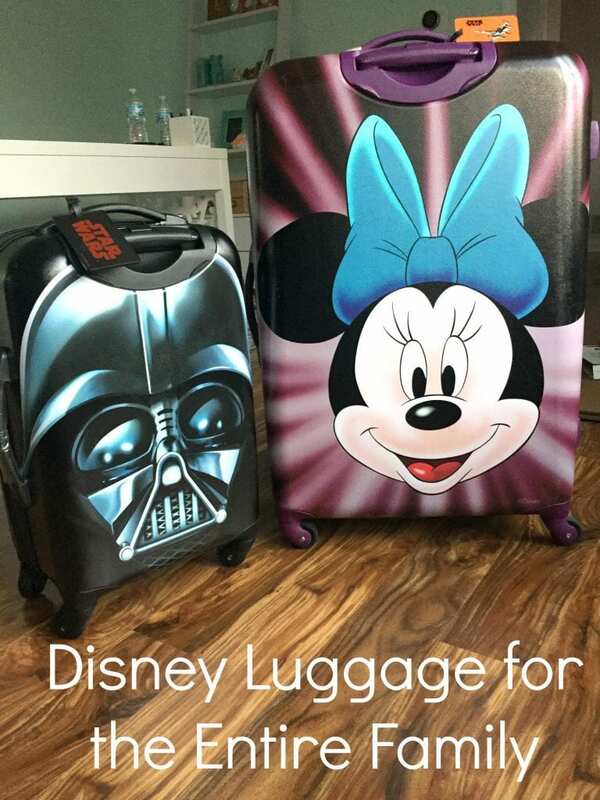 My husband takes his Disney luggage on trips all of the time! 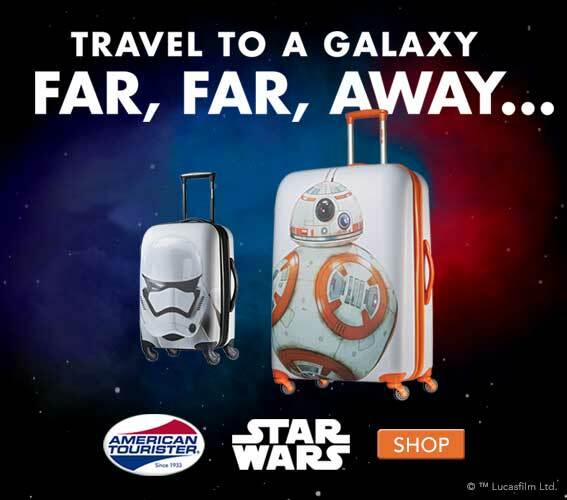 American Tourister has many different Star Wars characters from R2D2 to our newest favorite droid, BB-8! There are favorites from both sides of the force just waiting for you to take them on an adventure! If your daughter isn’t into Minnie Mouse, be sure to check out their selection of Disney Princess luggage as well. My daughter has started to get into princesses and I am sure she would love the Disney’s Frozen luggage. All of their products have the quality that you would expect from American Tourister. One of my biggest pet peaves with luggage is when the zipper gets stuck! We have had no problems with the quality of American Tourister. This luggage will last us for a long time! If you are not planning on any big trips in the near future. You should also check out the great selection of Disney backpacks from American Tourister. You will see just as many great characters here, from R2-D2 to the characters from Disney’s Frozen. My daughter loves the Finding Dory backpack! These backpacks will make your back to school shopping a little easier! You can plan for your next adventure with your favorite characters. Be sure to visit American Tourister to see everything they have to offer. They just released a Marvel collection that you have to see to believe! Go out and travel the world with a little bit of Disney Magic by your side! A huge thank you to American Tourister for providing my family with some luggage. All opinions are 100% mine. This post contains affiliate links, thank you for supporting us!